THERE WAS a man who had three sons, the youngest of whom was called the Simpleton, and was despised, laughed at, and neglected, on every occasion. It happened one day that the eldest son wished to go into the forest to cut wood, and before he went his mother gave him a delicious pancake and a flask of wine, that he might not suffer from hunger or thirst. When he came into the forest a little old gray man met him, who wished him good day, and said, "Give me a bit of cake out of your pocket, and let me have a drink of your wine; I am so hungry and thirsty." But the prudent youth answered, "Give you my cake and my wine? I haven't got any; be off with you." And leaving the little man standing there, he went off. Then he began to fell a tree, but he had not been at it long before he made a wrong stroke, and the hatchet hit him in the arm, so that he was obliged to go home and get it bound up. That was what came of the little gray man. Afterwards the second son went into the wood, and the mother gave to him, as to the eldest, a pancake and a flask of wine. The little old gray man met him also, and begged for a little bit of cake and a drink of wine. But the second son spoke out plainly, saying, "What I give you I lose myself, so be off with you." And leaving the little man standing there, he went off. The punishment followed. As he was chopping away at the tree, he hit himself in the leg so severely that he had to be carried home. Then said the Simpleton, "Father, let me go for once into the forest to cut wood"; and the father answered, "Your brothers have hurt themselves by so doing; give it up, you understand nothing about it." But the Simpleton went on begging so long, that the father said at last, "Well, be off with you; you will only learn by experience." The mother gave him a cake (it was only made with water, and baked in the ashes), and with it a flask of sour beer. When he came into the forest the little old gray man met him, and greeted him, saying, "Give me a bit of your cake, and a drink from your flask; I am so hungry and thirsty." And the Simpleton answered, "I have only a flour and water cake and sour beer; but if that is good enough for you, let us sit down together and eat." Then they sat down, and as the Simpleton took out his flour and water cake it became a rich pancake, and his sour beer became good wine. Then they ate and drank, and afterwards the little man said, "As you have such a kind heart, and share what you have so willingly, I will bestow good luck upon you. Yonder stands an old tree; cut it down, and at its roots you will find something," and thereupon the little man took his departure. The Simpleton went there, and hewed away at the tree, and when it fell he saw, sitting among the roots, a goose with feathers of pure gold. He lifted it out and took it with him to an inn where he intended to stay the night. The landlord had three daughters who, when they saw the goose, were curious to know what wonderful kind of bird it was, and ended by longing for one of its golden feathers. The eldest thought, "I will wait for a good opportunity, and then I will pull out one of its feathers for myself"; and so, when the Simpleton was gone out, she seized the goose by its wing- but there her finger and hand had to stay, held fast. Soon after came the second sister with the same idea of plucking out one of the golden feathers for herself; but scarcely had she touched her sister than she also was obliged to stay, held fast. Lastly came the third with the same intentions; but the others screamed out, "Stay away! for heaven's sake stay away!" But she did not see why she should stay away, and thought, "If they do so, why should not I?" and went towards them. But when she reached her sisters there she stopped, hanging on with them. And so they had to stay, all night. The next morning the Simpleton took the goose under his arm and went away, unmindful of the three girls that hung on to it. The three had to run after him, left and right, wherever his legs carried him. In the midst of the fields they met the parson, who, when he saw the procession, said, "Shame on you, girls, running after a young fellow through the fields like this," and forthwith he seized hold of the youngest by the hand to drag her away, but hardly had he touched her when he too was obliged to run after them himself. Not long after the sexton came that way, and seeing the respected parson following at the heels of the three girls, he called out, "Ho, your reverence, whither away so quickly? You forget that we have another christening today"; and he seized hold of him by his gown; but no sooner had he touched him than he was obliged to follow on too. 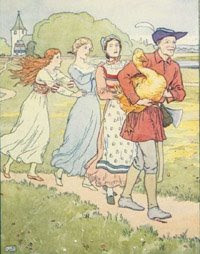 As the five tramped on, one after another, two peasants with their hoes came up from the fields, and the parson cried out to them, and begged them to come and set him and the sexton free, but no sooner had they touched the sexton than they had to follow on too; and now there were seven following the Simpleton and the goose. By and by they came to a town where a King reigned, who had an only daughter who was so serious that no one could make her laugh; therefore the King had given out that whoever should make her laugh should have her in marriage. The Simpleton, when he heard this, went with his goose and his hangers-on into the presence of the King's daughter, and as soon as she saw the seven people following always one after the other, she burst out laughing, and seemed as if she could never stop. And so the Simpleton earned a right to her as his bride; but the King did not like him for a son-in-law and made all kinds of objections, and said he must first bring a man who could drink up a whole cellar of wine. The Simpleton thought that the little gray man would be able to help him, and went out into the forest, and there, on the very spot where he felled the tree, he saw a man sitting with a very sad countenance. The Simpleton asked him what was the matter, and he answered, "I have a great thirst, which I cannot quench: cold water does not agree with me; I have indeed drunk up a whole cask of wine, but what good is a drop like that?" Then said the Simpleton, "I can help you; only come with me, and you shall have enough." He took him straight to the King's cellar, and the man sat himself down before the big vats, and drank, and drank, and before a day was over he had drunk up the whole cellar-full. The Simpleton again asked for his bride, but the King was annoyed that a wretched fellow, called the Simpleton by everybody, should carry off his daughter, and so he made new conditions. He was to produce a man who could eat up a mountain of bread. The Simpleton did not hesitate long, but ran quickly off to the forest, and there in the same place sat a man who had fastened a strap round his body, making a very piteous face, and saying, "I have eaten a whole bakehouse full of rolls, but what is the use of that when one is so hungry as I am? My stomach feels quite empty, and I am obliged to strap myself together, that I may not die of hunger." The Simpleton was quite glad of this, and said, "Get up quickly, and come along with me, and you shall have enough to eat." He led him straight to the King's courtyard, where all the meal in the kingdom had been collected and baked into a mountain of bread. The man out of the forest settled himself down before it and hastened to eat, and in one day the whole mountain had disappeared. Then the Simpleton asked for his bride the third time. The King, however, found one more excuse, and said he must have a ship that should be able to sail on land or on water. "So soon," said he, "as you come sailing along with it, you shall have my daughter for your wife." The Simpleton went straight to the forest, and there sat the little old gray man with whom he had shared his cake, and he said, "I have eaten for you, and I have drunk for you, I will also give you the ship; and all because you were kind to me at the first." Then he gave him the ship that could sail on land and on water, and when the King saw it he knew he could no longer withhold his daughter. The marriage took place immediately, and at the death of the King the Simpleton possessed the kingdom, and lived long and happily with his wife.